Recessions serve to unwind the excesses of the past expansion cycle. While the immediate odds of a US recession is still relatively low right now (see A recession in 2020? ), and there are few excesses in the economy, the problems are found outside US borders. 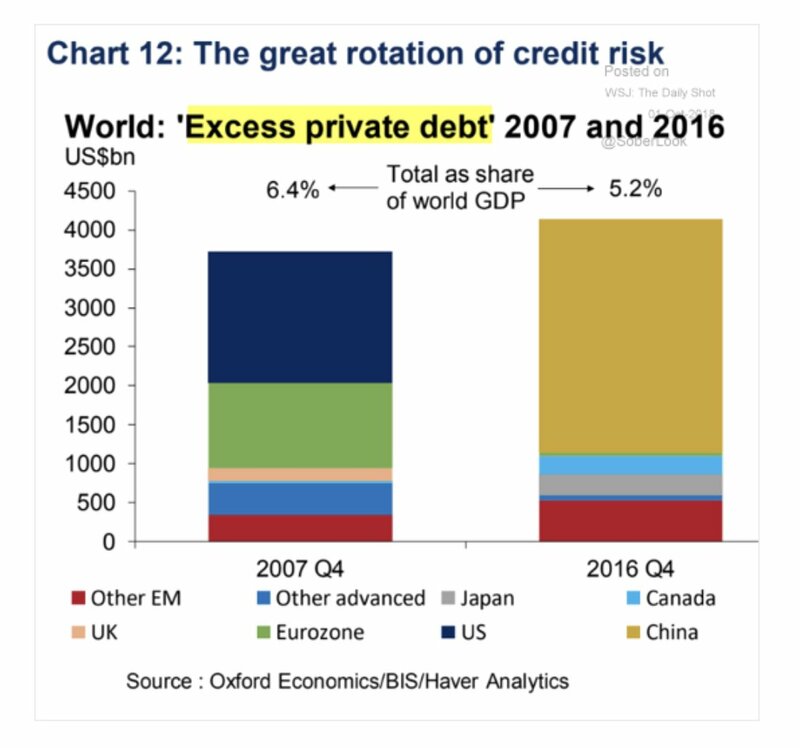 This time, most of the excessive private debt accumulation has occurred in China, and Canada. Cracks are starting to appear in five highly leveraged economies: Canada, Australia, Norway, Sweden and New Zealand. 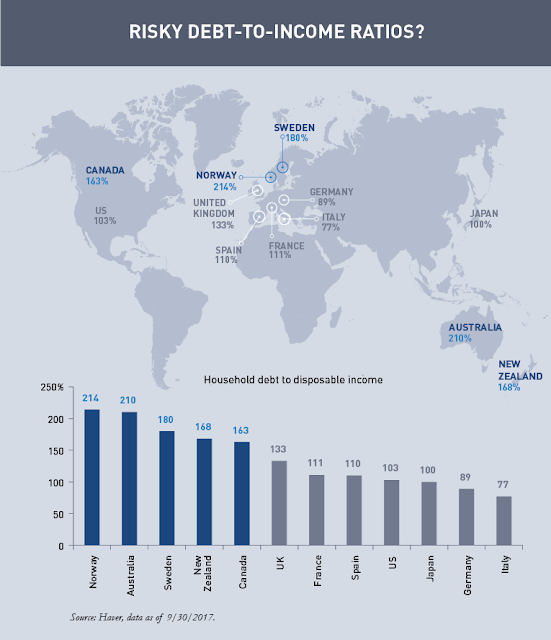 For several years following the global financial crisis, these five countries all shared a common theme—a multi-year housing boom, fueled by low interest rates, which resulted in very elevated levels of household debt. This boom is starting to dissipate in all five markets. 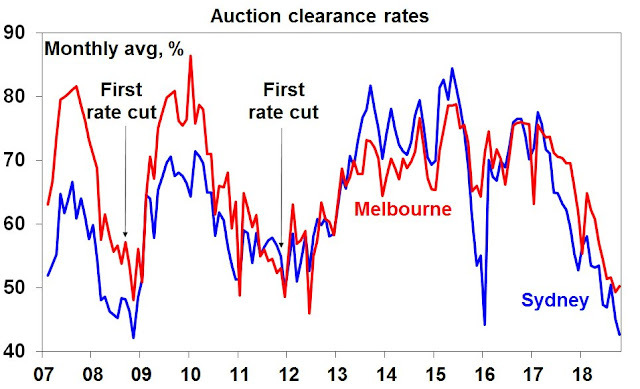 House prices have largely reversed course, be it slowing appreciation or outright decline. Moreover, this is occurring even as interest rates remain at or near record lows and labor markets continue to be robust. Importantly, this is a correction that many thought could not occur given the otherwise strong economic growth backdrop in these countries. 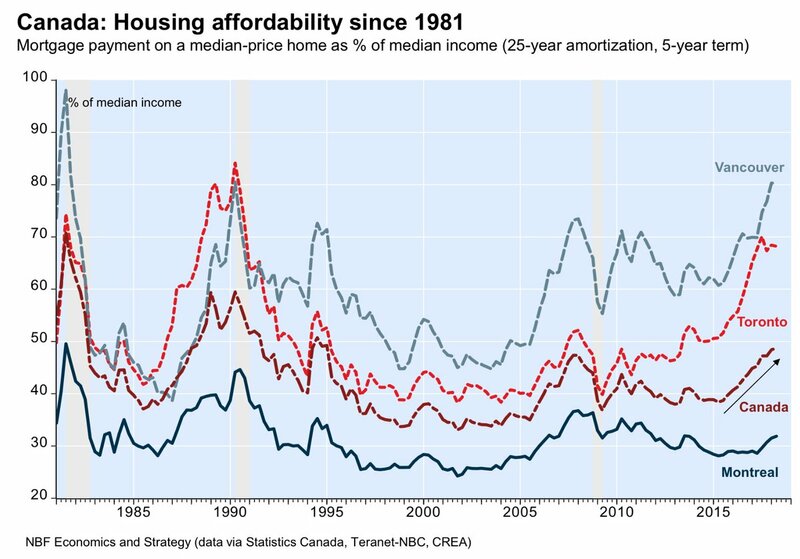 But we take a long-term view of house prices, and began highlighting affordability problems in these markets several years ago. There are signs are growing that those property bubbles are popping. In Australia, auction clearance rates are tanking. These conditions are consistent with the ongoing price declines. 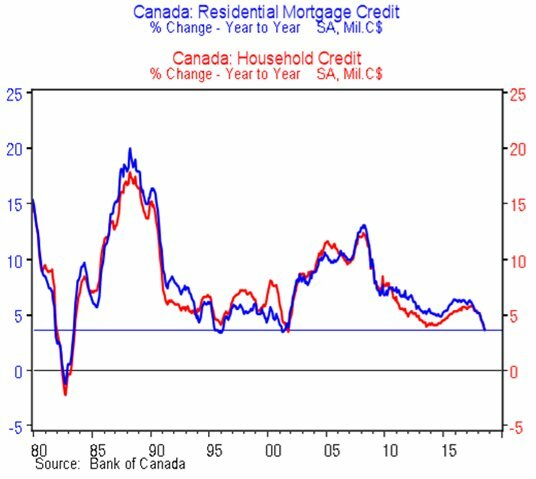 Here in Canada, we are seeing signs of the combination of poor affordability and an ongoing credit crunch. In the two most exposed markets, Toronto and Vancouver, affordability has been historically worse, but not much. The BC Securities Commission (BCSC) is cracking down on registration exemptions for private mortgage investments. The move comes as the province’s regulator will also no longer allow finders to sell shares of prospectus-exempt companies without being a registered exempt-market dealer. It appears that the latest round of administrative measures is finally having an effect. We are seeing a credit crunch in the mortgage market. Undoubtedly other central bankers will be watching Canada as a test of the effectiveness of macro-prudential policies as a way of deflating bubbles. In an environment where the Fed is raising rates, my guess is this will end with a crash and not a soft landing. The popping of the property bubbles in markets such as Australia and Canada have global implications. These bubbles were sparked by the leakage of China’s great big ball of liquidity into those markets (see How China’s Great Ball of Money rolled into Canada). Since then, Beijing has made capital flight leakage more difficult, especially for foreign property investment. A decision by Country Garden Holdings, the mainland’s largest developer by sales, to cut prices by up to 30 per cent at projects in two cities during the week-long national holiday, has sparked angry protests by scores of buyers who paid full price ahead of the discounts. The protesters, some seen holding Chinese-language placards that read “return my hard-earned money”, gathered at a Country Garden residential projects in Shangrao, Jiangxi, and at another project by the developer in Pudong, Shanghai on Saturday. The demonstrations comes after Country Garden lowered the selling prices of its residential project, named Shangro phase one development, in Jiangxi from 10,000 yuan per square metre (US$1,883.43) to 7,000 yuan per square metre. The Chinese have seen nothing but boom in property prices and the perception is prices can only go up. I shudder to think what happens to the effects of the Great Ball of Liquidity reverses. 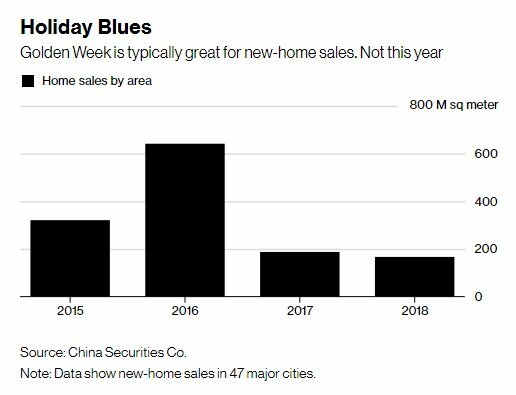 Last week was the Golden Week holidays, and real estate sales are usually buoyant during that period. This year is turning out to be an exception. Already, Beijing is acting to try to cushion the downturn. The PBOC announced on the weekend it is cutting the Reserve Requirement Ratio (RRR) for banks by 1%, and it will releast about 1.2t in yuan liquidity, including about 450b to repay maturing medium term lending facility (MLF) loans due October 15. The markets did not respond to the news of the easing measures. The Shanghai Composite cratered -3.7% after being closed last week, and the Hang Seng, which was open for most of last week, fell -1.4% in sympathy. The canaries in the coalmine are still the Chinese property developers. So far, issues like China Evergrande Group (3333.HK) fell -6.3% on the day, but long-term support is still holding (so far). Watch this space. A break of support will be the market’s signal of big trouble ahead for Chinese financial stability. Has the correction bottomed? What’s next? Well if the yuan craters as a response to real estate getting in trouble, this counters tariffs. Since China is a big buyer of gold, if the yuan depreciates then gold in USD should drop especially if with all of this the USD goes up. Of course there can be cries of currency manipulation, but nobody is saying that Brazil or Turkey are manipulating and those currencies are down. Would this cause a rush to treasuries? So far, no rush into treasuries. Bond market was closed today so let us see what happens tomorrow. Cam has documented that the Yuan is tied to the value of gold. So yes, if Yuan is devalued, gold will drop. It may cause US $ to rally, but that would be time to buy gold, for long term investors. Your premise about rush into treasuries is correct, with a twist. Staples with high dividend rallied yesterday, that can be seen as bond proxy. Check out PFE, MO, PMI, MAC, KIM etc. All said, let us see what October earnings have in store. Gas prices at the pump are 2.85$ a gallon, not exactly cheap. Cam, market seems to be getting pretty oversold, are you close to closing out your short or do you believe this has a ways to go? I am inclined to take partial (or full, if you are so inclined) profits on my shorts and then short again into the inevitable bounce.